On December September 3rd, 1939, Britain declared war, along with France, Australia and New Zealand, on Nazi Germany. Fearing the worst, the British government issued 38 million gas masks to its population in anticipation of a possible gas attack during air raids. As the Nazis marched across Europe they invaded France, Belgium, Luxembourg and the Netherlands with Holland and Belgium surrendering in May 1940. The Nazis bombed Paris as Norway surrendered and France fell to Germany. The potential attacks on Britain were real and looming. In August 1940, Nazi Germany launched a bombing offensive against airfields, factories and other strategic targets in Britain. The first air raids to hit central London began on August 23rd 1940. 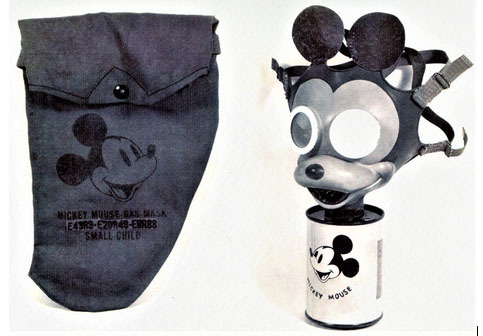 A production version of the Mickey Mouse Gas Mask, courtesy of the U.S. Army Chemical Corps. 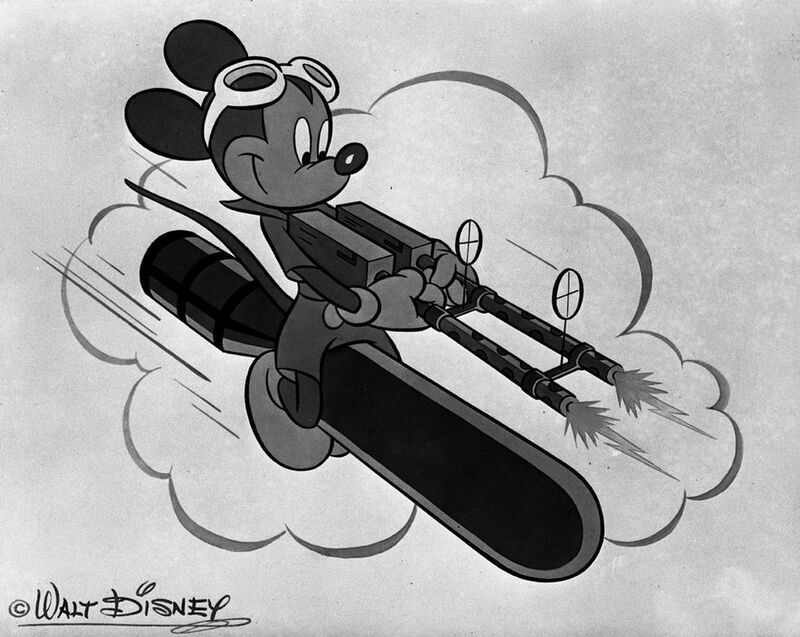 A natural product extension for the company was gas masks, especially for children, and it is clear that there was some correspondence between Disney, Sun Rubber and the War Department on creating an actual Mickey Mouse Gas Mask. As the aforementioned letter went on to point out, “…the use of “Mickey Mouse” has had a soothing effect on the little children in England. Just imagine how much better the reaction would be to the program you have under consideration.” T.S. 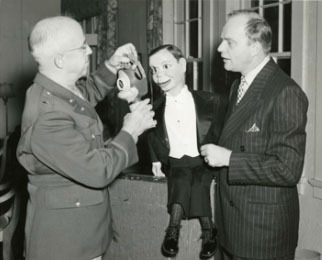 Smith, the owner of The Sun Rubber Company, first approached Disney about creating a children’s gas mask using Disney characters. 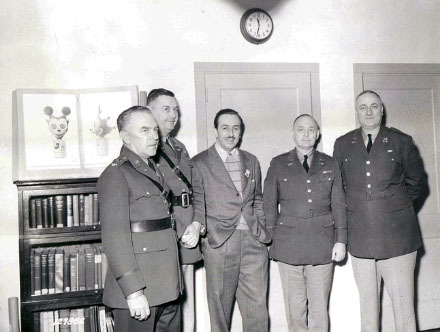 Shown (L to R) are Col. George J.B. Fisher, Chief of the Civil Defense Division, Col. Maurice E. Barker, Chief of the Technical Division, Walt Disney, Maj. Gen. William N. Porter, Chief of the Chemical Warfare Service, and Col. Paul X. English, Chief of the Industrial Service. Note the pad on the bookcase showing orthographic views of the Mickey Mouse gas mask. The Walt Disney design drawing for a Pluto Gas Mask and the prototype of the Three Little Pigs Gas Mask made by The Sun Rubber Company. These were never officially approved or manufactured. PIC Magazine, 1942. As the various participants were trying to gather support to mass produce the Mickey Mouse Gas Masks, Sun Rubber had Rempel design several other gas masks using other Disney characters. There was a Pluto mask designed and a Three Little Pigs gas mask prototype created. Neither was ever mass produced but they did appear in PIC Magazine. The article indicates that, “The exterior of the mask is designed by Walt Disney. It is aimed at keeping the “fun element” in even such grim experiences as gas raids.” Okay, that’s a stretch. The article went on to say, “During these raids children will be persuaded to regard the whole thing as a game. Instead of mobs of morbid, screaming children, we shall have giggling, happy youngsters—blessedly unaware of the poisoned atmosphere which lurks outside their gas masks.” I had to reread that section twice as it was a chilling passage in the article titled THE “REAL THING” WITH KID APPEAL. But, as horrible as that may sound, it is no different than children having to do active shooter drills today. 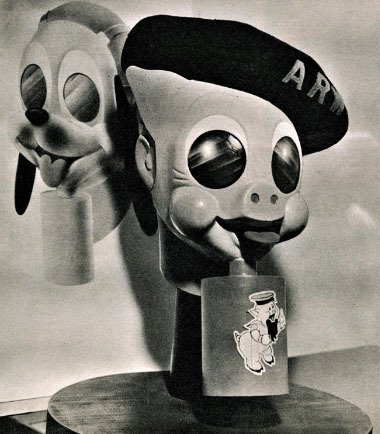 The Three Little Pigs mask is particularly creepy looking with its Army beret adornment. Can you imagine a classroom of twenty or thirty children all wearing that mask and scurrying around screaming? Nightmarish for sure. At the outset of the U.S. involvement in WWII, there was a real fear that the country could be attacked on either coast after the Pearl Harbor attack. German submarines, U-Boats, had been spotted in the waters off of Long Island. At the time, New York Mayor LaGuardia proposed that some 50 million gas masks be ordered for issue to citizens living in coastal areas. Although that quantity was never ordered, a year after the Pearl Harbor attack, there were 300,000 gas masks distributed across the country to personnel at strategic locations. By then, the fear of gas attack had subsided and the thinking among military brass, on both sides, was that a gas attack was ineffective compared to the use of explosives. Bombings destroyed infrastructure and heightened fear in the population. Further, materials were being rationed and the rubber used for that many gas masks was better allocated to other types of military equipment in support of the war effort. As ghastly as it seems to produce 1000 Mickey Mouse Gas Masks, today these items may possibly be one of the Holy Grails of Disney collectables. Aside from the couple in museum collections, I only know of one collector that has the Disney themed cloth pouch but no gas mask and another who has just the mask. The only problem with these gas masks is, that after close to seventy years, the rubber oxidizes. This means that the rubber surface begins to crack and changes occur to “the molecules of the polymers that constitute rubber” which causes general deterioration and breakdown of the rubber mask. 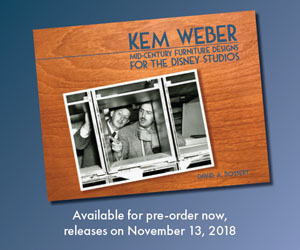 Yet, still it would be an exceptional Disney piece to have in any collection. Yes, you are absolutely right, it should be September 3, 1939. I have no idea why I wrote December other than I was writing this piece in December! Thank you for pointing that out, I’ve asked that it be corrected. Terrific article! Superbly researched, fills in a lot of gaps (and cancels out some common misinformation ) on this obscure but fascinating chapter! Great article. 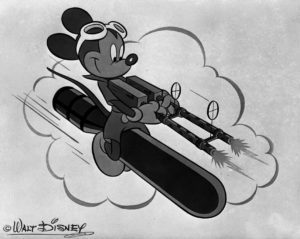 The most detailed account I have ever read about the Mickey Mouse gas mask and I have read several over the years. Great original research. I never knew about the Pluto and Three Little Pigs (people forget how hugely popular those characters were for a period of time) prototypes. Thanks for your note and the wonderful quote from Eric Idle. Yes, I am aware of the film. 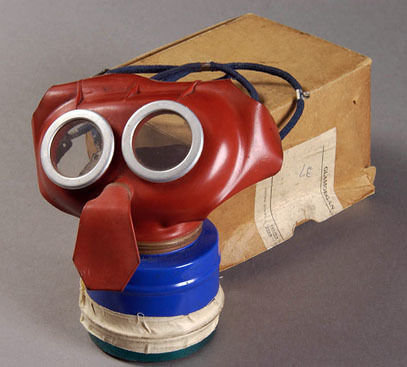 The focus of my article was on the actual Mickey Mouse gas mask. Thanks for your note.